Drawing on the talents of assemblage artist, Stacey Mattraw, we discovered the “artist within” at this heartspark Adventure. With access to Stacey’s library of materials, fabrics, decorative papers, ribbons, buttons and grommets, plus photos, ticket stubs, letters and whatever else we brought from home, there was no limit to the creative inspiration in the room. Being surrounded by works of art in Stacey’s creative studio – influenced by her passions for the old world and all-things Italy where she lives part of the year – inspired our inner artists to emerge. 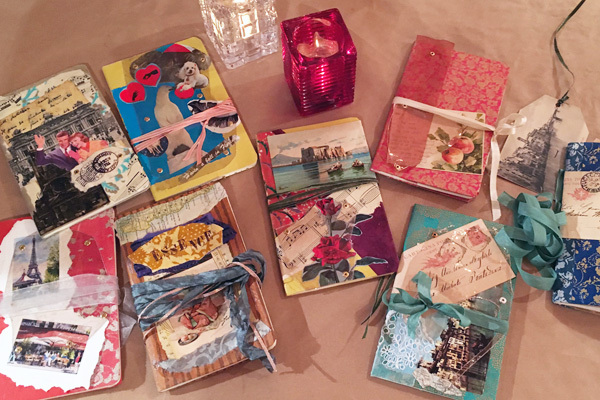 With her expert direction and inspiration from her own amazing journals, we had all the help, support, and creative direction to bring our own unique journals to life. With heartspark, my future is so bright, I’ve gotta wear shades.